TV with Thinus: TV CRITIC's NOTEBOOK. At E! 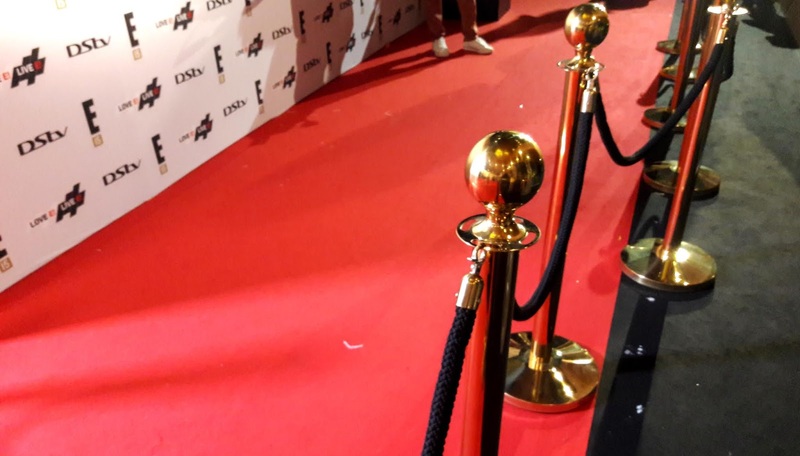 's 15th Africa anniversary party, I tried to ask ProVerb just one question - and then something happened that made me think about what's reasonable to expect from TV stars who decide to be on the red carpet. TV CRITIC's NOTEBOOK. At E! 's 15th Africa anniversary party, I tried to ask ProVerb just one question - and then something happened that made me think about what's reasonable to expect from TV stars who decide to be on the red carpet. During Thursday night's 15th anniversary celebration event of E! Entertainment (DStv 124) in Johannesburg I spotted the Idols presenter and producer ProVerb on the red carpet when he arrived and posed for photos - but something subsequently happened that made me think about, and decide to do this editorial column, about what is, and maybe isn't, reasonable to expect from TV stars who decide to show up and appear at a red carpet event. Firstly, I have to say upfront that I've never had even the slightest issue with, and that I've always actually admired and liked Tebogo Thekisho - ProVerb or "Pro's" real name - whom I first met over 8 years ago just before he joined Idols from the 6th season back in 2010 as co-presenter. I've watched and tracked, with respect, Tebogo Thekisho's career in South Africa's TV industry since the rapper - who launched his TV career on M-Net's Channel O on MultiChoice's DStv satellite pay-TV service - moved from just being a presenter to also taking on a producer role. From the 8th season of Idols in 2012 he also took on added responsibility behind-the-scenes when he became co-executive producer of Idols on Mzansi Magic (DStv 161) together with Gavin Wratten at [SIC] Entertainment. We once both stayed over in the Big Brother house as part of a media group experience and over the past 8 years during the various Idols seasons I had some quick chats with him, made jokes and would congratulate him - all off-the-record - mostly after Idols season finales during the after-parties and when the winner and runner-up would get their prizes and where he would be the MC on stage. While most of the press attending would hang around at the bar-side and barely pay attention, I always listened, followed and would stand close to the front of the stage and give my attention, time and applause because to me it matters. The last time before Thursday that I saw Pro in person was two weeks ago when I did a set visit for Idols' upcoming 15th season where I sat for hours during the new batch of contestants' performances for the judges as they had to make their decisions during Theatre Week as to who they're going to cut and who they're going to keep. At the end of the day's recording when everybody got up and left, I decided to walk to ProVerb to go and say hello and made a quick joke about one of the contestants who will be part of a wonderful unfolding twist for viewers when the episode is broadcast sometime during August. Cue Thursday night, and when I spotted Pro, dapperly dressed up in a snazzy bronze jacket on the red carpet at the party of NBCUniversal International Networks to mark the 15 year presence of E! as a channel in South Africa, as a journalist I instinctively approached him to ask him a question for one of the articles I'd be doing covering the event. When I went to say hi and asked him on the red carpet if I could quickly ask him just one question, his response was not now. I stood to the side and waited for him to finish the photo-taking and as he then headed towards the Alice & Fifth nightclub where the E! party was taking place, I quickly walked alongside him and asked again if I can just ask him one question. "No, no, no, no no," he said as he kept walking and disappeared inside as I stopped and he looked back a last time. To be honest, I didn't know what to make of it and it rarely happens that I feel that way and so weird, but I felt extremely awkward as I was just left standing there, wondering what happened. Then I commented on his post of "Popped into Sandton to congratulate E! on their 15th anniversary in Africa! ", with how I felt, saying: "But won't stop to answer just one question for the media asking about E!. Disappointing." Later Friday morning I heard from him in a direct message and responded, and he messaged again - the conversation of which I won't recount here since it was a private chat - and when my flight landed there was another message from Proverb who, after sending another message, also "blocked" my Twitter account making any personal response back impossible. After what happened with ProVerb it made me think: Do we as press and the media next to the rope line at red carpet events expect too much of the people on it? Is what reporters covering red carpet events think they can do and ask there, perhaps too big of an ask? And on the other side of the coin: Are journalists allowed to say "I'm disappointed that so-and-so didn't come to play"? When people in the public eye and who choose to be in the public eye, appear at media launches and events, is it a right or a wrong assumption for the working press and journalists to have an expectation that the people are there to, and willing to, interact with the media? Of course people - famous, infamous and the non-famous - have the right and personal choice to decide whether they want to answer a question, "that" question, or any question, and the freedom to say what they want to say, as well as who they want to, or don't want to talk to. And what about media management - the building, creating, maintaining, and investing in media relationships with the press and journalists? Does going to a red carpet event where you know media will be present necessarily mean it comes with a type of "responsibility" to engage with that media to whatever degree? Or can you attend in a type of incognito mode and leave personal and professional brand building for another day and other events as and when you choose? Why would people go to a media event where they know media will be but then not want to talk or engage with the media? Personally, I don't know the answers to all of these questions and I don't know what people think. What I do know from my side, is that when I'm at a media event I'm there to work - which is why I RSVP'ed. Insofar as people go to a "party", my assumption is that they're also actually there as part of work. I seek out people that I know, and who are part of my work to know, and I will continue to cover them and the events I'm at, as I constantly seek information and try to ask whoever, questions about whatever, on behalf of the public. As a TV critic and as a journalist I look forward to the upcoming 15th season of Idols on Mzansi Magic and how it will play out this time. Who knows, maybe next time I might just get lucky, and get ProVerb to answer a question.